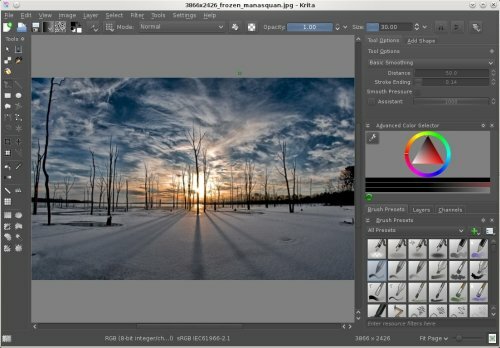 Krita 4.1.7 Portable » TopFreeSoft.Net - Best Freeware Software! Quickly pick your color and brush by right-clicking on the canvas. You can also use Krita? ?™s tagging system to swap out the available brushes that are displayed. The ring outside of the color selector contains the most recently used colors. These settings can be configured through the preferences. Customize your brushes with over 9 unique brush engines. Each engine has a large amount of settings to customize your brush. Each brush engine is made to satisfy a specific need such as the Color Smudge engine, Shape engine, Particle engine, and even a filter engine. Once you are done creating your brushes, you can save them and organize them with Krita? ?™s unique tagging system. It is easy to create seamless textures and patterns now. Press the ???W? ?™ key while painting to toggle wrap-around mode. The image will make references of itself along the x and y axis. Continue painting and watch all of the references update instantly. No more clunky offsetting to see how your image repeats itself.